An investment in a master’s degree can enhance your skills in the workplace, make you more marketable, and increase your salary. For students who plan to pursue a doctoral degree, the master’s at Brandeis provides an important credential. With your goals in mind, our Office of Financial Aid will work with you to help you to realize the greatest return on your educational investment. *Peace Corps: Though we do not have a formalized agreement, we appreciate your service to the Peace Corps, and will consider your participation when packaging your financial award, in addition to offering an application fee waiver. For all of the above awards, questions should be directed to Monique Howell (mhowell@brandeis.edu). Please note that the service-based scholarships may not available in combination with each other and/or another Brandeis award (i.e. alumni scholarship, merit award, etc.). If you are eligible for a Brandeis award that is higher than the service award, we will award the higher amount at the discretion of GSAS. Awards are not final until issued through the Graduate School of Arts and Sciences. Most of our master’s students receive generous scholarships in the form of merit- and need-based aid. Often awarded at the time of admission, merit scholarships do not require a separate application unless noted for a particular program. These awards are made to both international students and U.S. citizens. Scholarships usually provide partial tuition and may be supplemented by low-interest government loans. With a few exceptions, our master’s programs allow you to enroll part-time, thus giving you the ability to continue working and pay tuition on a course-by-course basis. Scholarships are typically available for part-time students as well, which can greatly reduce your out-of-pocket costs. Scholarship availability and amounts may vary by department. All awards are granted and accepted with the understanding that the student must maintain a superior level of academic progress. Ordinarily, no student may hold a scholarship, fellowship or assistantship for more than two years of study for the master's degree, or more than three years for the M.F.A. degree. Brandeis alumni/seniors: We are proud to offer a $2,000 per year scholarship for Brandeis alumni (or current Brandeis seniors who have their bachelor's degree by the time they start a master's program) who are admitted into most GSAS master's programs. Need-based scholarships are available on a limited basis to qualifying students who are enrolled at least half-time (6 credits per semester). Students apply for a need-based scholarship by completing the Free Application for Federal Student Aid (FAFSA). The Brandeis code is 002133. We encourage applicants to fill out the FAFSA at the same time they apply to their graduate program. The FAFSA may be used to consider students for both need-based scholarships and federal loans (see below). Award amount varies, but the maximum offer for master's students is $12,000; The maximum offer for MAT students is $6,120. Students serving as Course Assistants for Arts and Sciences. A fellowship is an academic award of honor to outstanding students to help them in furthering advanced study, research, and training in teaching. A small number of master’s programs offer fellowships to their students (please check with your department of interest to see if they award fellowships). Often awarded at the time of admission, fellowships do not require a separate application unless noted for a particular program. Both international and U.S. applicants are considered for departmental fellowships. A fellowship recipient must pay tuition unless the award includes a scholarship in an amount covering tuition. Fellowships are paid to students every two weeks in the form of a stipend check. All awards are granted and accepted with the understanding that the student must maintain a superior level of academic progress. Ordinarily, no student may hold a fellowship for more than two years of study for the master’s or more than three years for the MFA degree. Priority in making fellowship awards is given to full-time students. Research and/or course assistantships are available in several master’s programs, especially the sciences (please check with your department of interest to see if it awards assistantships and what the work component may entail). Often awarded at the time of admission, assistantships do not require a separate application unless noted for a particular program. Both international and U.S. applicants are considered for assistantships. Assistantships are paid to students biweekly in the form of a stipend check. All awards are granted and accepted with the understanding that the student must maintain a superior level of academic progress. Ordinarily, no student may hold an assistantship for more than two years of study for the master’s or more than three years for the MFA degree. Learn more about how to apply for federal and other loans, including step-by-step instructions. If you finish your residency requirement but still have courses left to take for your degree, you can do so at a discounted rate. Are you a Brandeis Alum? Learn more about our special scholarship for Brandeis alumni. This semester, Mahala Rethlake, a master's student in the Philosophy department, is grappling with key ideas in Aristotelian thought and philosophical perspectives on gratitude and forgiveness. 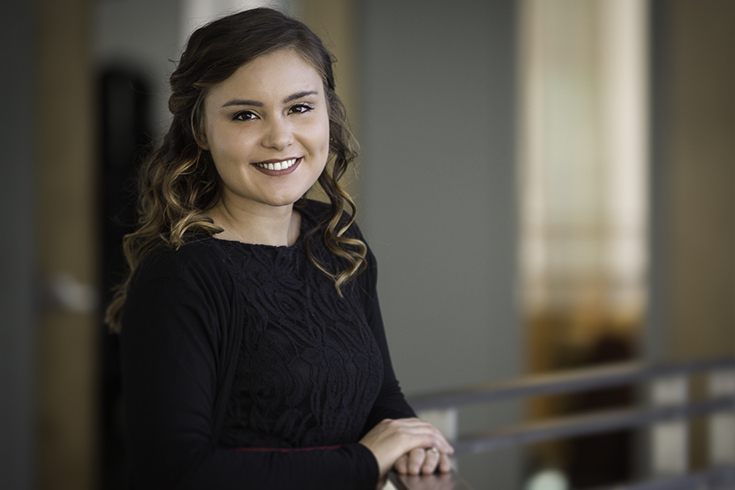 As a member of the first ever Diversity, Excellence and Inclusion Scholarship (DEIS) cohort, Mahala's experience at Brandeis has been impacted not only by the support of faculty and the wider community, but by the encouragement of her fellow DEIS scholars.